Today I went to have a little party with my parents, Ron and my granny and because of the damn heat problem it took place at my parents´flat. The day was made fine by a great strawberry tart, self- made apple strudel, self - baked pizza from my mum, looooooooooooooots of great presents (a warm feather blanket), some knitting of the first sock and shopping. I bought myself a new pair of cuddly boots, a pair of darkbrown/purple cord trausers, some tins of honey (Avocado and Mango honey, they didn´t have more of my beloved chestnut honey), a pair of bedshoes, some magazines, 2 sheep keychains, instant tea and some small things for my spoilee. Plus I went to take a closer look at "my" wool shop at the ancient part of Köpenick where I went regularily when I lived nearby. I was incredibly lucky to meet the owner herself, because she moved away to West Germany some months ago. She fell madly in Love with a boy there, moved to him and just occassionaly drops in to make sure everything is all right. She still is hunting for my lana grossa "bingo" yarn and told me, that she was to the shop where she hopes to find some a lot of times by bus but always arrived during the shop´s luch closing time. She promised to try and go there by bike. The shop in Köpenick now sells even addi DPNs (5mm and very thick wooden ones), they have a new range of felting wool in nice colours, and more beads than ever. I hoped to finally find some really bulky Aran- like 100% pure new wool which should be coloured, and they had some kind but it was only wickyarn. What a bummer. Instead the owner recommended a sock wool from Austermann and seemed happy when I told her that I managed the boomerang - heel. I bought one ball of this sock wool called "step" and the colour is called blackberry (in fact there are some shades grey and raspberry). I also bought a half high knitting nelly which can produce strings twice so thick than before, a pipe of Gütermann beads (the colour is something copper/bronze like) and a scented candle with tangerine scent. The shop owner told me that she liked these scented candles because they weren´t causing headaches. wowowo, what a great day! Today, one of my birthday presents was something I´d like to thank Hannah from Blackpool, GB sooooo much! I am very besotted with the "simply knitting" magazine and she sent the November issue to me. But it wasn´t only the again so well succeeded magazine, it was a whole bundle. The bundle also included a simply knitting calendar for the next year with lots of great patterns and a booklet with nice knitting projects from Rowan (the yarn producer). Waaaaiii, perfect! *happy* Thank you so, so, so much dear Hannah! Oh, and before I forget, I got an eCard from my secret pal. Thank you secret pal, this was a really funny animation. half all double sitches need to be casted on as one in this 2 rows which are full rounds. 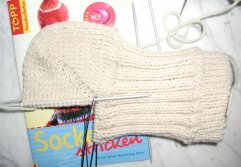 Wow, the finished heel looks similiar to the socks from supermarket. Incredible! Of course I´m going to show you this improvement and took a photo immediately. After this I showed my result to Tina, Elena and my parents via Skype webcam. Man, I am proud that this process went into my brain now, I still can´t believe it is true. I bet I am going to become a sockaholic just like some of the knitting bloggers I read. Thanks to Tina, Elena and my parents for their help. 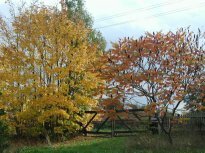 I love the season of autuumn. Not only because my birthday is in autuumn but also because one can cocoon into the house to enjoy tea and crafty things. But the main reason I love fall is because of these terrific colours. By the way, the trees on the photo are those which we see from our bedroom window which is facing the south. Nicol, my hostess posted some kind of contest. We are to write something bizarre, funny - a random fact about ourselves. Well for me it is something that even my family members listened to with their mouths open. Last year in September when I did the first -aid day course which is necessary for the application for a drivers licence (which I passed this January), everybody had to let her/his eyes get tested because if that fails one cannot give the application for the drives licence (and licence exam) to the drivers´licences department. Well we were 16 people and I went with my boyfriend who had paid the fees for me (and I still have to give them back to him). I was the 6th to get my sight tested. I usually have to wear glasses even though I don´t wear them at the moment because if I do so I get a headache. I sat down with my glasses (I am short sighted) on my nose and had to look inside an apparatus. There were black circles, filled white on a white background, with a gap somewhere. I had to tell if the gap was left, right, down, up or somewhere between. My problem - which my eye doctor named to me- is that rotund forms and numerals (like 0, 8, 9, 6 and 3) float and I cant see them focused if they are too small, move or are too far away. I very often catched the wrong train, because the trains here have numbers like 60, 63, 61, 68 . I often found myself going into the wrong direction once inside the wrong train because I had been running to catch it and hadn´t seen the numerals correctly. I was told that the dimensions inside the apparatus simulate a certain distance. I told the people behind the apparatus the gaps - I really had to concentrate on them because of this damn floating. I had them wrong. All of them. I was so schocked and asked if I could repeat the test at the end of all and they said "ok, but this is an exception". I went outside the room to talk to my boyfriend who was so angry because I had started with drivers lessons and he had already paid them and without this test I couldn´t go on. I was thinking through this whole situation again and again and finally found out that I hadn´t had the feeling of distance inside the apparatus. Remember, I usually don´t need my glasses for a good sight in less than 20 -50 metres, not to tell about 20 cm. I decided to repeat the test without my glasses. As I did so the testers were astonished. Unlike all others I had 100% ! I did not make any mistake, I was the only one with no mistake at all! I got my certificate of sight and everything is fine! I can drive without glasses but I prefer to drive with them - especially on the highways. Usually glasses help people to see better but in my case I went better without them. This is really the truth and I am quite happy about it, because at the moment with this headaches I have to drive without my beloved frameless glasses and the police can´t give me any fines if they´d stop me to see my drivers licence. things for the banitza she was going to bake for me. (banitza is a typical bulgarian filo pastry filled with sheep cheese, butter, spinach or leek or combinations of these). After this we all three sat down with a good yogi chai tea with milk and honey, some cake and I read out the instruction for the heel from my book to my parents. I hoped that they would be able to understand or imagine how this should be done but they weren´t. So I was picked up by my boyfriend Ron and went with him to a friend of mum´s called Achim to get a radiant heater. I hope that our new central-heating boiler will arrive soon, we´ ve been waiting for 2 months now. ... was 2 days ago. But on the 1st of September I had my SP9 questionaire and the wishlist online (I took the one from the previous year). On the 15th of September I updated it to be complete and told Shelby that I did so. I was so full of joyfull anticipation. I don´t know why but it seems to be invisible. It is a plain text link (there is no button in the SP9 blog so I have none yet) below the secret pal 9 button on the right side of this page. When clicking the link, the questionaire does not include this link or the wishlist link (which is below AND linked inside the questionaire), but I´ll fix that. Well TODAY apart from a mail that my secret pal is alive and well. I got mail from the USA! It was an envelope with a beautifull stamp on it showing the yosemite national park in CA. which I like for my collection. Inside was a greeting card (this is the red picture) and inside was a congratulation for my birthday (the other picture). But my birthday is the night before Halloween, the 30th of October - 14 days to go. However. At least today is one of those very rare days that my mailbox wasn´t empty and the sun is shining and no cloud is in the sky.